The historic land run of 1889 settled the Oklahoma City area in a single day. Thousands of people staked claims in an area that a day earlier had only a railroad station and three buildings, and Oklahoma City was born. It didn't take long for leaders to begin organizing the city. 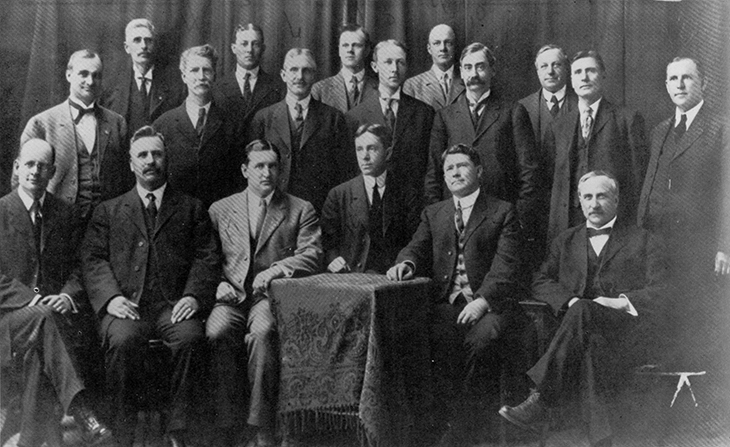 The Board of Trade, the forerunner of the Greater Oklahoma City Chamber of Commerce, was organized to promote the community. Now, for more than a century, the Chamber has been the driving force behind the growth of the Oklahoma City area. At the city's birth, the Chamber led the way in providing utilities to the community, such as the water system, telephone exchange, electric light and a gas system. The Chamber also opened the door to transportation for the community. The extension of the railroads was the key to the city's success. Through the Chamber's successful efforts, Oklahoma City became a crossroads for the nation. The Chamber focused on bringing new industry to the new city. A cotton compress and large flourmills were among the new companies in town. But a turning point for the city came in 1909 and 1910 when two meat packing plants chose to locate here. From this time on, Oklahoma City grew at a steady rate. Also in 1910, in a statewide election coordinated by the Chamber, the people voted to make Oklahoma City the capital of the State. As long as there's been an aviation industry, it has been represented in Oklahoma City. Early on the Chamber had an aviation committee which pursued such tasks as the 1926 bond issue of $10,000 to improve the city airport. The Chamber went on to supervise the improvement and upkeep of the airport, as well as assisting other communities by establishing 24 landing fields across Oklahoma. In the 1940s, the Chamber purchased land at the city's airport to preserve it for aviation and military development. Later the Chamber, the City of Oklahoma City and the Civil Aeronautics Administration (CAA) signed an agreement to lease the land to the CAA, which is known today as the Federal Aviation Administration (FAA). The Chamber has continued to work with the FAA to ensure its growth and success in Oklahoma City since that time. When the Chamber received word that the United States was looking to establish an Air Corps Depot in the middle of the nation, the Chamber began promoting Oklahoma City as the site for this new development. In April 1941, the announcement was made that Oklahoma City had been selected for a depot. The depot, now known as the Oklahoma City Air Logistics Center, located on Tinker Air Force Base, became a major employer in the community. Today the Chamber continues to work closely with Tinker officials to ensure the success of what is now the state's second largest employer. The greatest development plan for Oklahoma City since the Land Run of 1889 is the Metropolitan Area Projects plan. The Chamber's leadership became involved in the development of the plan, along with City officials, in the early 1990s. In 1993, the Chamber took on the Challenge of promoting the MAPS plan and leading the campaign to pass a five-year, one-cent sales tax to fund nine major projects for Oklahoma City. The citizens of Oklahoma City passed the sales tax on December 14, 1993 with a 54 percent majority vote. The MAPS plan included renovations to the Civic Center Music Hall, Cox Convention Center and Oklahoma State Fairgrounds; construction of a 20,000-seat Indoor Sports Arena, the 15,000-seat SBC Southwestern Bell Bricktown Ballpark and a new Library/Learning Center; development of a Trolley Transit System for transportation between the I-40/Meridian area and downtown; development of the North Canadian Riverfront; and construction of the Bricktown Canal. In 1998, the Chamber managed the 'Finish MAPS Right' campaign to extend the MAPS sales tax for six months. It passed with a 68 percent majority vote, ensuring that all nine projects would be completed debt free. In December 2009, a record number of Oklahoma City voters went to the polls and voted YES to continue Oklahoma City's bright future through the $777 million MAPS 3 initiative. MAPS 3 includes eight projects that will work to increase the quality of life for all Oklahoma City citizens, as well as create economic growth through private investment and the creation of jobs. The eight projects include improvements to the Oklahoma River, 57 miles of new walking and biking trails, improvements to State Fair Park, sidewalks, senior health and wellness aquatic centers, a new convention center, a world-class destination park and a modern downtown streetcar. The temporary one-cent sales tax began April 1, 2010, and will be in effect for 93 months. The City is currently working to create the Citizen Advisory Board that will assist in the planning and progress of the projects. Chamber leaders in 1889 dreamed of creating a city from a tent-community and made their dreams come true through hard work and dedication. Today, the pioneering spirit of the early day leaders can still be seen in the Chamber's leadership. Leaders continue to dream and by working together, will make their dreams become realities in the future.